Samsung has announced six new TV series that it’s introducing to its VR Video service for its Gear VR, with a pilot episode from each made available today. The shows are the result of a select few indie filmmakers who received a grant from Samsung in order to produce original VR content. They were given access to Samsung’s 360 Round camera as well, although only one series (&Design) chose to utilize it. You can check out the brief trailer of the initiative (dubbed Pilot Season) below, which gives you a glimpse into the vastly different genres and themes that each of the six new series explores. An original episodic series about design that will change the way we look at the world. The series presents design in its intersection with science, technology and anthropology, weaving an array of items that link each episode by a universally humanistic theme. A scripted sci-fi comedy series in VR, set in a New York City of the future. Two British robots – Otis and Roberto – arrive in New York and join the NYPD. Otis acts like a Downton Abbey butler. Roberto is rough and tough, from the other side of the tracks. They are best friends. In 1899, Sigmund Freud published his magnum opus, The Interpretation of Dreams, which shocked the world and forever changed our understanding of dreams and the unconscious mind. This episodic narrative fiction series reimagines each of Freud’s original case studies as visually luxurious, psychologically complex, and emotionally haunting immersive VR dreamscapes. The Earth is evolving and digesting our human footprint. Now humanity has a choice – stay or leave. Lightcatcher is an odyssey that revolves around earth and its people in the year 2150. Get lost with five adventurers as they travel through unique environments – enduring hardships and triumphs in the new world. 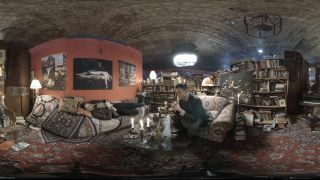 Set in a collection of real world locations, this fresh, funny and irreverent VR series challenges its viewers to spot eight surreal and unexpected Easter eggs hidden within each episode. Sam’s Surreal Gems is the antithesis of overly familiar futuristic and fantastical VR, rather, this series will celebrate the truly entertaining and wonderfully funny possibilities within the real world already around us. A virtual reality animation that takes you on an epic journey from birth to death. Comprised of six distinct movements, “Voyages – Pilot” guides you through the emotional arc of an entire life. Experience what it feels like to be born, to grow up, to grow old, and to eventually die. If you’ve got a Samsung Gear VR, you can head to the Oculus Store and find the free Samsung VR video service to download. Once downloaded, check out Pilot Season under the service’s Featured section.